A fast and flavourful small-batch treat! 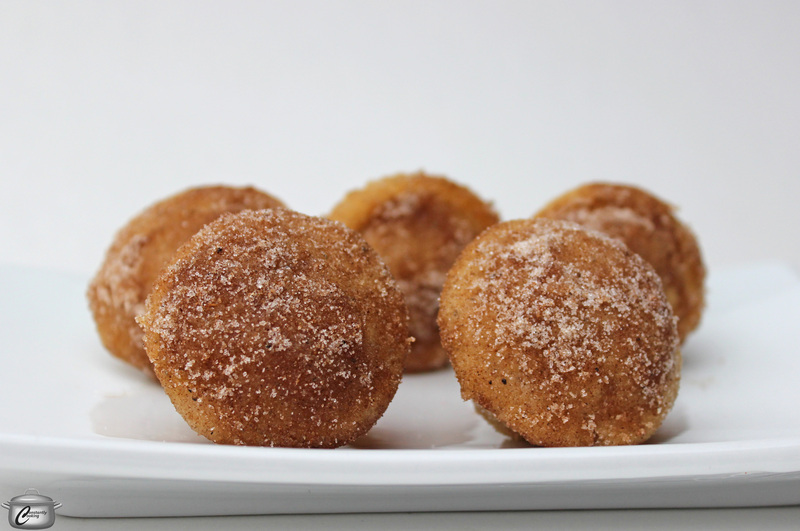 I first started making baked donuts a few years ago (check out this fantastic maple-glazed version) and found they were just as delicious as their less-healthy deep fried cousins. These little ones – made in mini muffin pans – are particularly light and tasty; putting the spices both in them and on top of them really adds a lot of flavour. I have found it’s better to bake them in greased pans rather than paper-lined ones as they come out just a little crispier, which is the way I like them. These are best enjoyed the day they are baked, however they are still extremely tasty the next day. 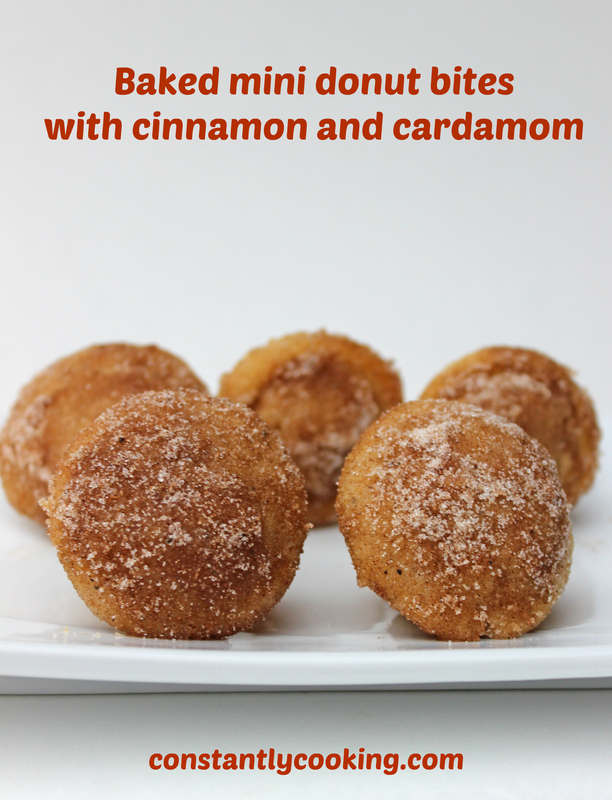 If you’re not a fan of cardamom, you can use just cinnamon, or a combination of cinnamon and ginger. Preheat oven to 350F. Grease 18 mini muffin cups with cooking spray, canola oil or butter. In a glass measure or small bowl, stir together the milk and vinegar and let sit (this turns the milk into buttermilk). In a large bowl whisk together the flour, baking powder, baking soda, cinnamon, cardamom, salt and sugar. Set aside. In a small bowl whisk together the egg, buttermilk mixture and vanilla. Pour in the melted butter and whisk until well blended. Add the wet ingredients to the bowl of dry ones and use a wooden spoon or silicone spatula to fold the mixture until no dry spots remain, taking care not to overmix it. Use a small cookie dough scoop or two teaspoons to transfer the batter to the prepared mini muffin pans. Place in the preheated oven and bake for 9 – 11 until a tester comes out with just a few crumbs. Cool in pan for 3 minutes then turn out onto a wire rack and let cool ten minutes more. While donuts are baking, prepare the topping. Melt the butter in a small bowl (a custard cup or ramekin is great). In another small bowl, blend together the sugar, cinnamon and cardamom. When donuts are cool, pick each one up by the flat bottom and dip the round top in the butter, then in the sugar and spice mixture. Place on a plate and try not to start eating until you’ve dipped them all. Makes 18 scrumptious mini donut bites. This entry was posted in baking and tagged baked donuts, baked doughnuts, dessert, donuts, donuts in a mini muffin pan, doughnuts, doughnuts in a mini muffin pan, easy dessert, fast dessert, mini donuts, mini doughnuts, Paula Roy, spiced donuts. Bookmark the permalink. You just inspired me again! Is there no end to your talents, Paula Roy? Well, thank Dog for that! Oh yes, you know that, I didn’t get the chance to taste yet! Thank you for sharing. You are welcome – glad to share! Thank you for sharing! Keep sharing! Pingback: 100 Reasons To Not Kill Yourself: #51. | You've Been Hooked! Thanks for the shout-out…..I think I will surprise my family with fresh, hot homemade donuts for breakfast thanks to your inspiration!